Rocka. After the summer wave of Brain Attack was released, some people wished they would never hear that name again. The Hero in shining armor stole the spot for the first Xl hero, the first hero with a vehicle, and was the last new hero we were introduced to. This year, Rocka takes a step back and allows Evo to dominate the place for most appearances thus far. So how does Rocka fair this time around? 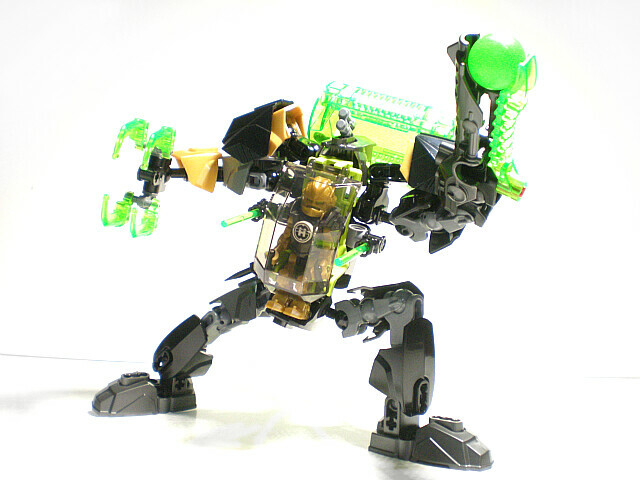 I enjoyed Rocka in 3.0, but other than that I haven't been a huge fan of his sets. This time around however, I think he is quite a nice set. Before we begin I'd like to once again thank The Lego Company and the Eurobricks Staff who made it possible for me to bring these reviews to you today. I'd also like to stress the point that the release date for these sets is Janurary 1st for ROW (rest of world) and March 1st for the U.S.
Rocka's bag art is quite brutal, showing the Stealth Machine grabbing onto the miniature Kaiju and firing at point black range. Looks like the Heroes aren't screwing around this time. I also really love the art at the top of the bag for this one, showing a view from almost inside the Stealth machines cockpit with the claw ready to grab the oncoming crawlers. 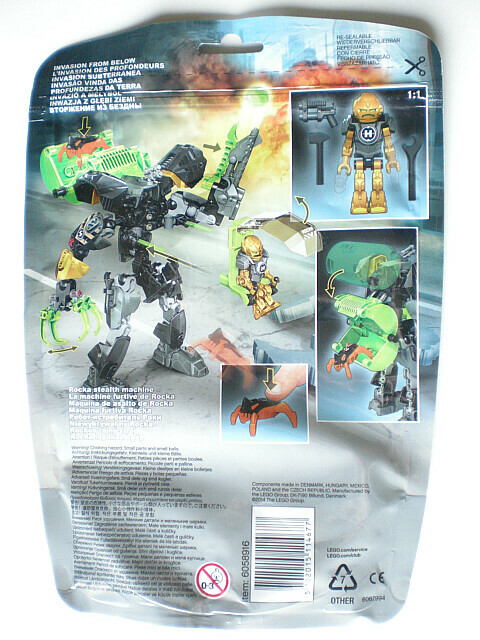 As always the back of the bag shows the features of the set, including the miniature kaiju's jumping feature, the containment pod, opening cockpit, moveable claws, and launching sphere. I'm still confused why the entire cockpit popping into the mech is shown as a "feature." Unless it was really difficult to show off the opening canopy feature when it was connected to the mech? No idea. Once more we get to see Rocka attacking the spider, and Freeze machine tanking through an explosion in the background. I've never had an issue when it comes to differentiating parts in an HF set due to their low parts count, however it is nice to see the effort put into show the colorization of dark bluish gray vs pearl dark gray, and black is set apart by a white outline. 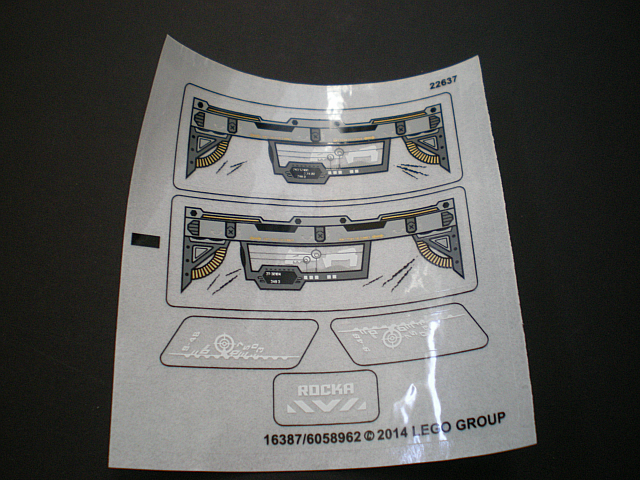 Here we have the sheet of stickers included with the set, which decal the canopy and the containment pod. For personal purposes I have not chosen to apply them to the set, however you can get a general idea for the purpose of them. 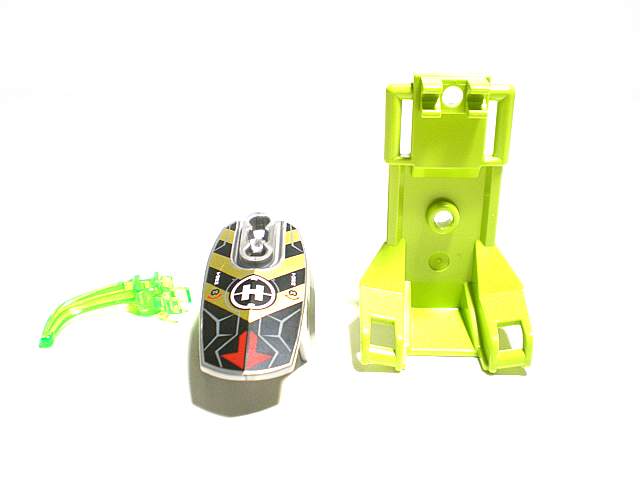 New/recolored/interesting bits start off with a trans bright green claw, the unique printed piece, and the seat in lime green. 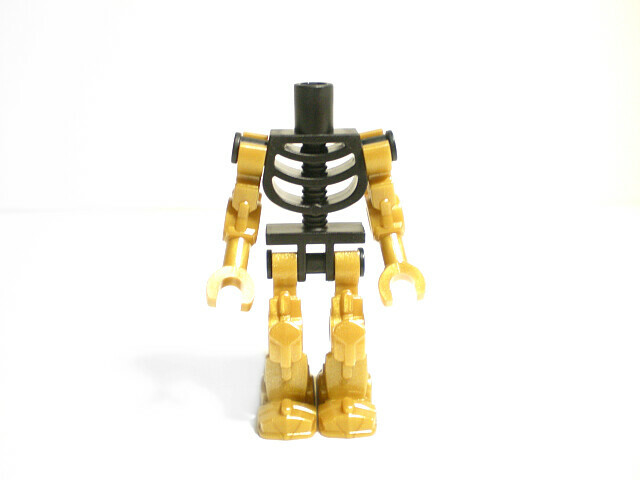 The minifigures begin with a refreshing new design from their previous year's counterparts, utilizing the minifig skeleton torso, thus giving them head, arm, and leg articulation. As many have said, they lack wrist articulation, as their arm piece is static. 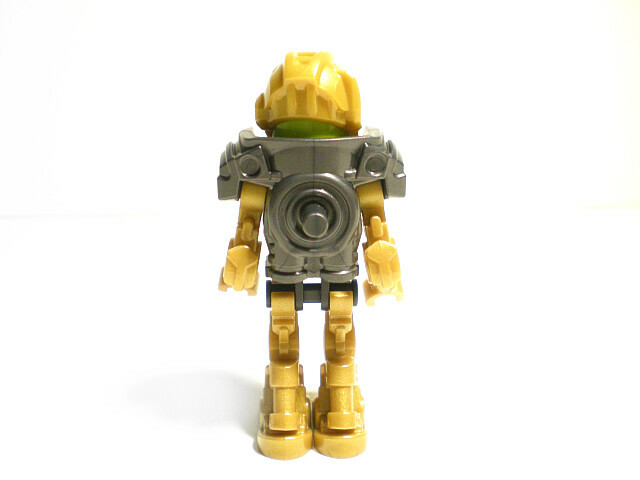 We add on the torso armor, which is compatible with a standard Lego minifig torso. The head is also a solid color; If it were tansparent like a lot of people wanted, it would be difficult to see the color because there are no slots for light to pass through to illuminate it. Rocka seems to draw some inspiration from his Brain Attack form, which unfortunately means he once again loses that telescopic eye that his Breakout form had. I wasn't sure of it's intent, but I did enjoy that design more. You'll notice the one problem with using this torso, which is the gap created by the torso armor. 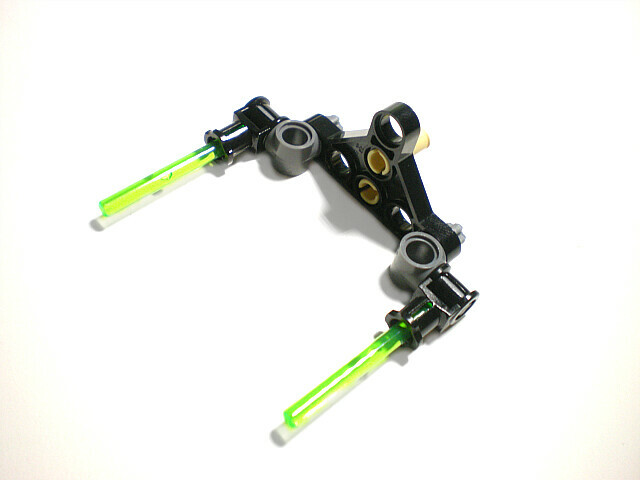 Also of note here is clip attachment points on the legs and wrists. A peg is here to attach his back to the mechs. 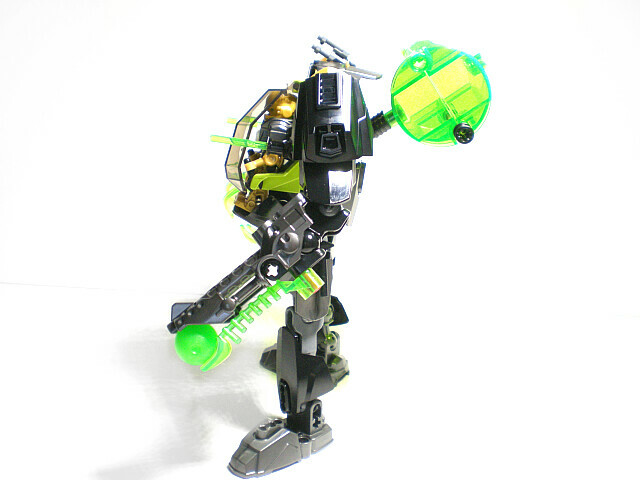 Accessory wise, Rocka includes a hammer, wrench, and a pistol. Nothing revolutionary to see here. 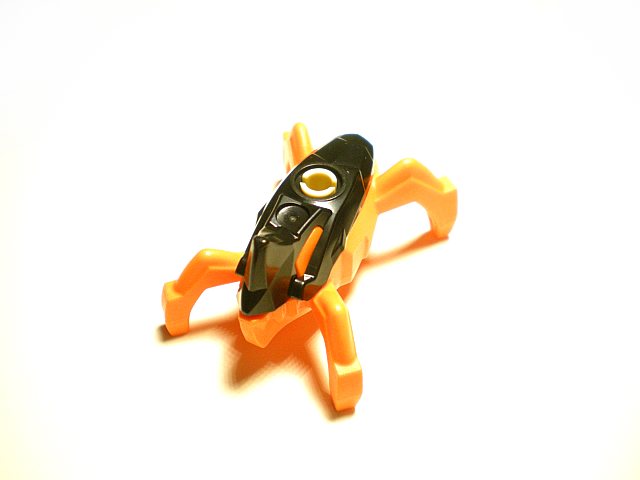 And here we have the miniature kaiju/spider/visorak whatever thing. I like that they threw these guys into the mix, and it's a cool homage to 2005. They are pretty basic, no articulation or anything. The colored piece is a soft rubber, whereas the black shell on top is hard plastic. This gives them a nice color scheme, however the pieces by themselves are quite strange bits. I look forward to seeing how these are incorporated into MOCs. When compared to the Jet Machine, Stealth Machine takes a step backward creativity wise for his torso. The only point of interest here is the way his shoulders are attached, which gives MOCists a great source of the shortest bone. 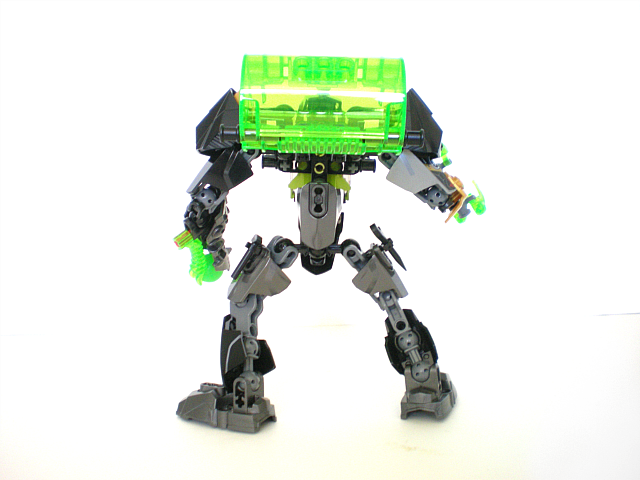 We add on more armor, and-Wait, isn't this a mech for Rocka? 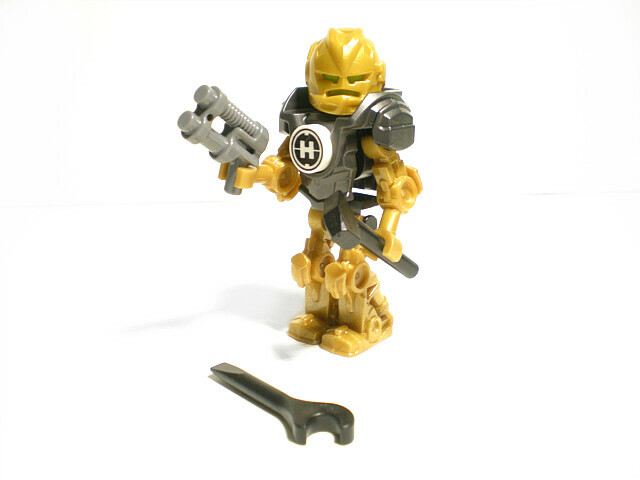 Where is his bling-bling armor? I suppose "stealth" translates to black armor, but in a gray city and fighting enemies who "rose from below" (dark places) I don't think this will be very effective. And as usual, the good start is completely ruined by unnecessary asymmetrical armor placement is random colors. Left arm looks good, but the random gold plate on the right is an eyesore, and I don't understand why Lego has kept up this compulsion to print pieces in colors that do not complement the set. it's the only silver part in the entire set, and would look far superior molded in black, or at least pearl dark gray. With that said, the gold appearing from the shoulder panels is pretty nice looking and effectively gives a hint of his true color but not going overboard. Here's an interesting bit I wasn't expecting, to create the...lasers on the side of the mech. If you dislike the look of these bars on the mech itself, then scraping this is sure to bring some useful pieces. We add on the small construct and the containment pod. 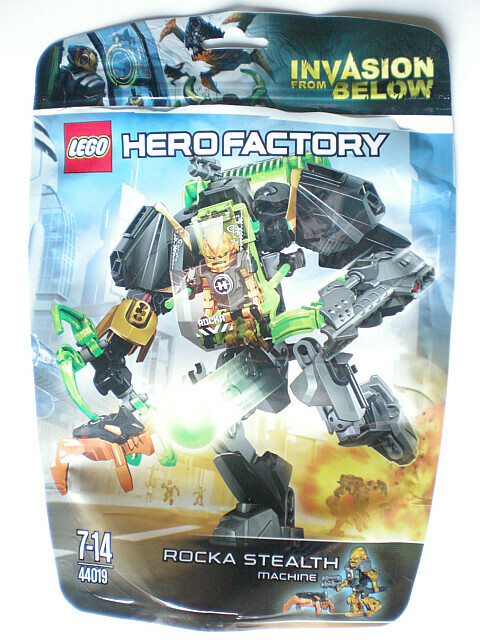 The trans bright green once again defeats the purpose of "stealth" if that is what they were going for here, but I've come to accept it as being Rocka's thing. Evo on the other hand, not so much. When it's finished, it actually looks quite nice. It brings about the "heavy" mech sort of feel, which I find a bit unfitting for Rocka as I have always associated him with being a thinner built character. 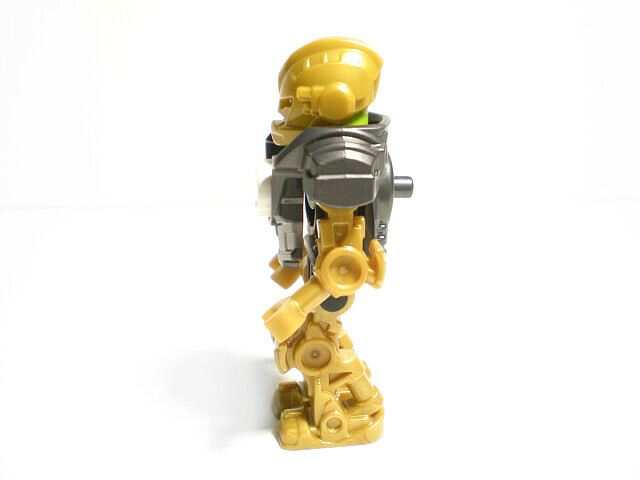 Like Furno, an armor shell is placed to give Rocka a spot to stick his feet. it works quite well, and helps to give a sense of completion to the main body. The gold panel on his arm looks somewhat less out of place when Rocka is sitting behind the controls, but I still find it a bit silly. As with all of the mechs, the containment pod just sticks out and looks somewhat odd. From the pictures I saw, Rocka seemed to look the best with this container, but in real life it's just annoying. I do like the part itself and plan on using it for MOCs, but as a feature of the set I'm not impressed. If there is anything positive to say about the pod, it's that it looks good from the back. Also the armor plate put on the help cover the back is much appreciated. The capture pod indeed "locks" when you close it, but it's not a hassel to open back up. Strangely you have to store the spiders sideways in here, and can't really fit more than 2. He does pose quite well when balance is concerned. The shoulder pads can be somewhat fiddly to rearrange every time you move the arms. Now here is the issue I have with these mechs. When it comes to posing, you are severely limited on what you can do, because the cockpit will always be facing one way. 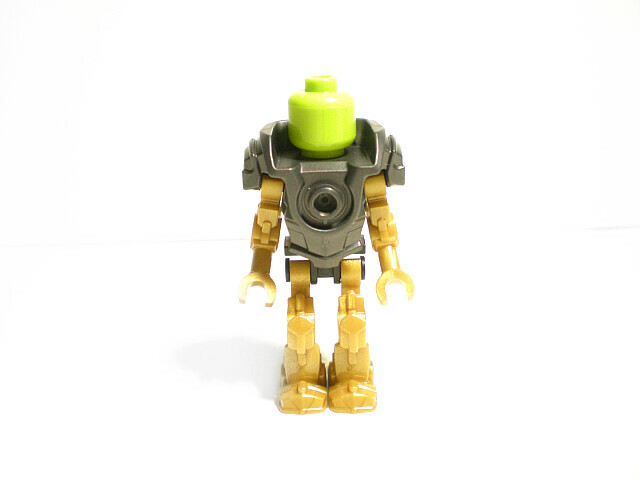 Turning the minifigures heads, when possible, is hard to notice and doesn't give the same effect as turning a larger set's head does. A dynamic pose like this looks goofy, as Rocka is just staring straight ahead into the horizon. 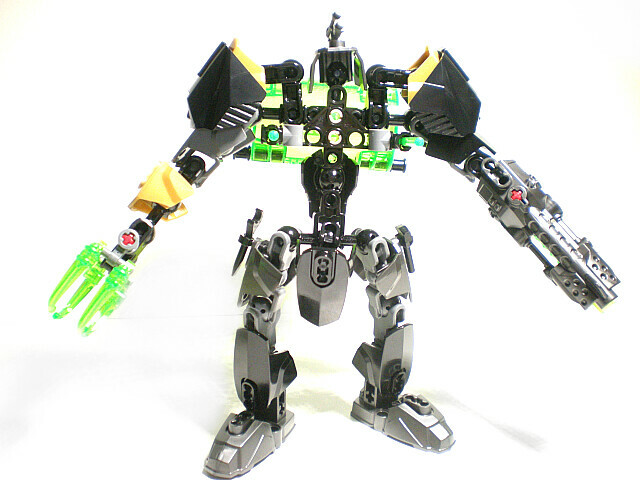 Overall, Rocka and Stealth Machine is probably my second favorite mech, just following Furno's jet machine. It has a nice looking design and is not hindered by any awkward connections. I like the color scheme, though I wish we could have omitted the gold completely, or at least have excluded it from the arm, instead replacing it with a layering on the legs(similar to the shoulder pads.). It's weapons are also nice, though the only reason I really have to put this behind Jet machine as my favorite mech is due to the torso. it's effective and gets the job done, but doesn't go to extremely unique lengths like Jet Machine does. 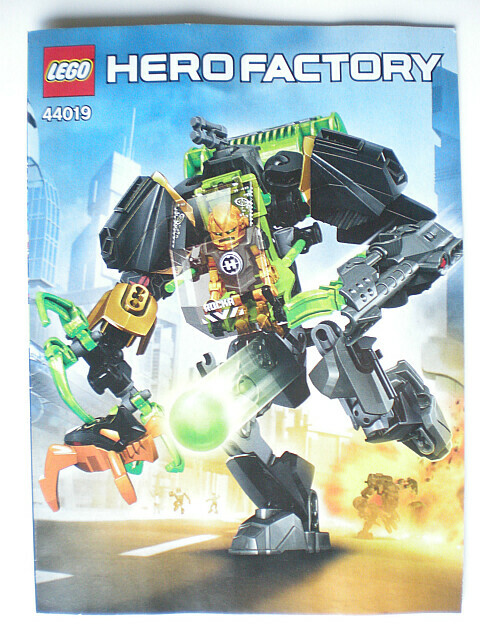 A good pick up if you want to get the best of the Mechs this wave, and if you are only getting a few sets I'd make sure this one is in your list to get. 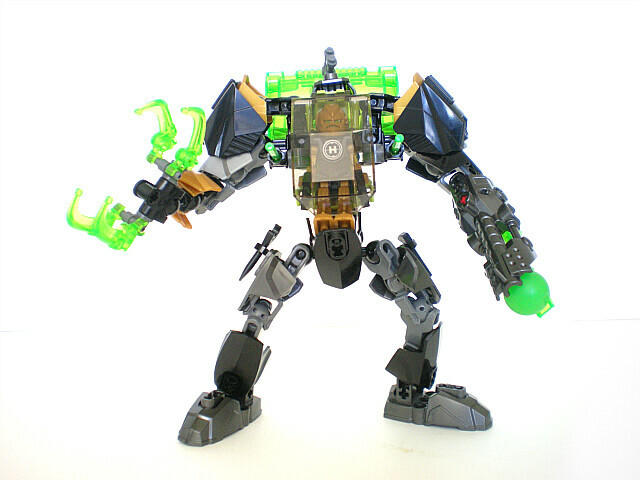 This mech looks fantastic, great overall aesthetic, thanks for the review. Thanks for the review! Still not a fan of the colour scheme, probably my least favourite of the mechs. And as usual, the good start is completely ruined by unnecessary asymmetrical armor placement is random colors. The set seems pretty solid. Probably my second favorite of the mechs. The color scheme seems off, but I thoroughly enjoy the claw, shoulder pads, and the Rocka minifigure. This fig is probably my favorite of the entire wave solely because of that facial expression. The containers on the back of these sets also seem quite awkward. I'm amazed if they don't affect the stability of the mechs. I like the set overall. Not sure if I'll get it, but that's because I'm still unsure about getting the Machines in general, for a number of reasons. I don't mind the printed shell TBH. If anything, the gold 3M shell on its lower arm looks more random to me. I can't tell, but are the 5M shells black? If so, major win for the designers. Those shells in black are insanely rare! Huh, interesting. I had thought the majority of the armor on this set was Titanium Metallic, but it turns out it's black. Can't say that makes it any better or worse in my book, as either could work for the "stealth" aesthetic, but it's still a surprise. Overall, I think the set's color scheme is nice. I imagine that the printed shell is Silver Metallic just to keep it consistent with the ones on the other mechs, and I can't say I mind the resulting look too much. I'm a little surprised how well the gold works when used so sparingly. I think I will use Rocka's legs to finally give legs to my Meca One that doesn't have legs because I got him in Striking Venom. Lovely bulky mech design. 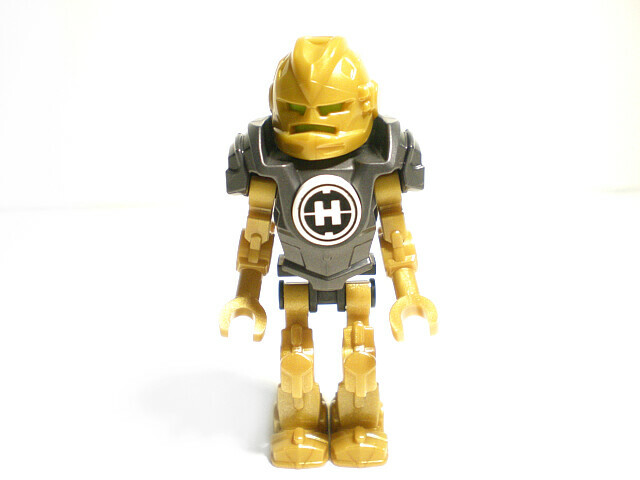 Can't complain about the minifigure accessories or the new HF minifigure robot parts in gold. The pod looks truly bad. Nice review! Like the shoulder pads on this one. 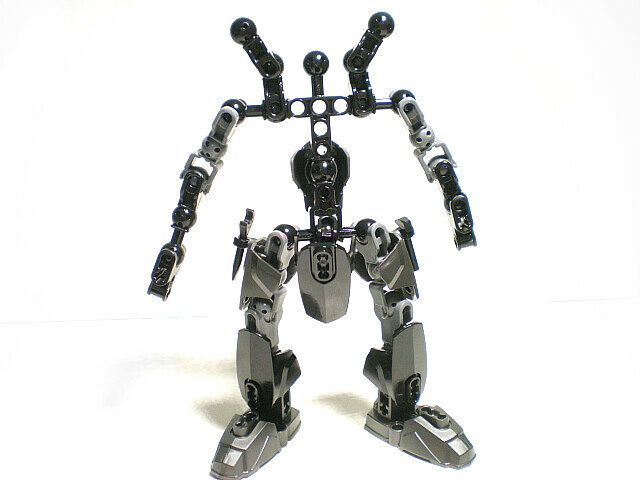 I'm just getting into these Hero Factory figures, and this one isn't my favorite mech. The $15 price point is a little too steep for me, so I'll most likely pass on this. The March 1st release date for the United States is odd though- what's up with that? Thats weird to hear, since my Striking Venom came with a pair of golden legs to put on Meca One when outside the cockpit. In fact, the same page you linked, Brickset, has them in the inventory of the set. Also, VNNB, you listed the green claws as a new recolor, but they already appeared in Scarox last year. 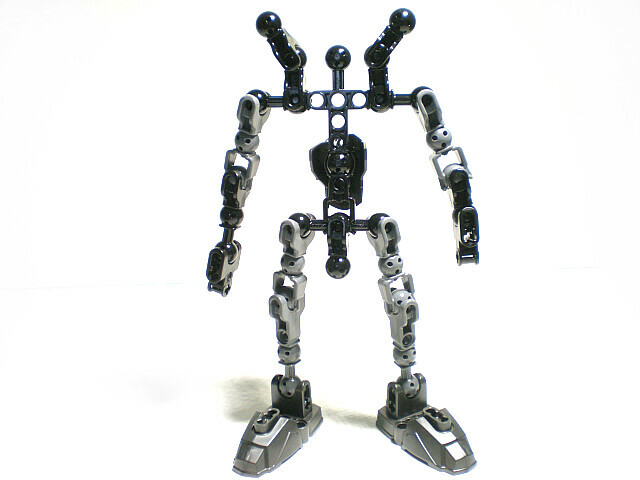 It's possible that there was a change in the set's inventory in later production runs since so many fans were disappointed not to get a complete Meca One minifigure. It is not unheard of for a set's inventory to change slightly in later production runs, though most of the time it's simply a matter of parts being taken out of production and replaced with newer variants. There was. Initial waves didn't have any legs however the production run after that included them in the polybag that was full of 2m pins. I got a smile out of thinking what logic Hero Factory were using when they thought a splash of gold on a 'stealth machine' would work. "Alright, it's all ready to go, Rocka." "No wayz, Zib. If youz think I'm gonna pilot that thing versus all those monstahs, think again." "We'll throw in a little gold." Joking aside, the gold on the arm is kind of distracting. We've got the big shoulder pads on the other gold parts that just make those parts look like detailing. We want to be sneaky, Rocka. We don't want everyone to know that you're coming. I do like the machine though. The colors all match the usual Rocka scheme, so I like it. The claw is an interesting tool here, and can be an interesting weapon as well. The Zamor cannon looks well at home here, though with all this bulk I was kind of expecting the more obvious choice for a machine like this. I like that Rocka can actually catch the kaiju and contain them. Wonder what he does with them after? Mmm, fried kaiju legs with a little bit of cajun pepper..
Looks neat, poses neat.. May have to pick this one up. Just a note; There is no way i am calling that a Stealth Machine. 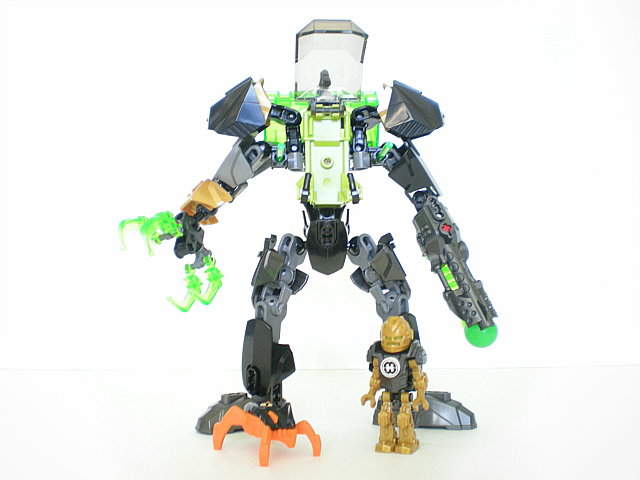 Anyway this set is my least favorite, the Gold and Trans-Bright Green do not fit as a Stealth Mech, I think it should be Trans-Black, Black and Pearl Dark Gray and speaking of colors is Rocka going to have a different color then just Gold and Pearl Dark Gray, that color is getting really annoying. Like what i said on your Review on Furno Jet Machine, I do love that all (but that one printed armor) are stickers and not printed parts, the posing is good because it meant to be facing one way and not the type of mech that you are thinking of. The build of the body look alright not the best and the weapons are odd plus don't like that Rocka Mech is the only one that have a Plasma Gun. Another thing i see that is good is that unlike Furno Jet Machine is that there are lest gaps. 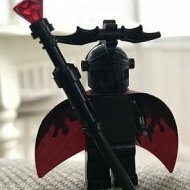 The Rocka Minifigure is my least favorite as well plus his helmet make him look like he need to go to the bathroom really badly. and the weapons are odd plus don't like that Rocka Mech is the only one that have a Plasma Gun. 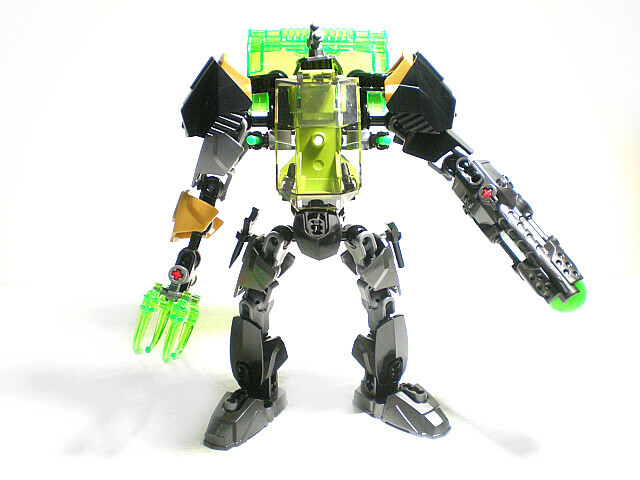 Anyway this set is my least favorite, the Gold and Trans-Bright Green do not fit as a Stealth Mech, I think it should be Trans-Black, Black and Pearl Dark Gray and speaking of colors is Rocka going to have a different color then just Gold and Pearl Dark Gray, that color is getting really annoying. Trans-Black, Black. 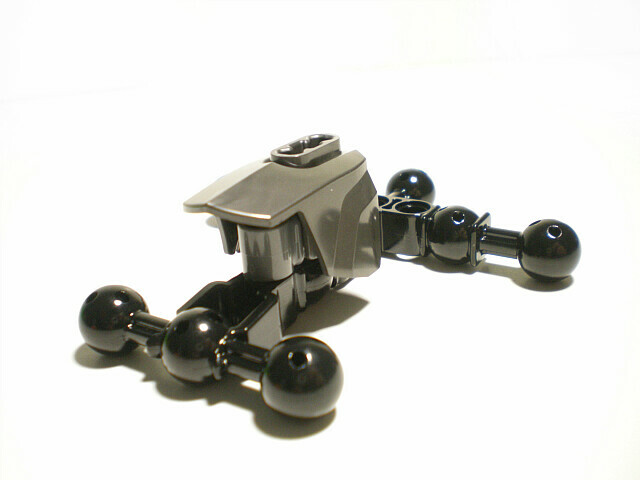 and Pearl Dark Grey would be an incredibly boring color scheme that I think would make for an incredibly boring set. I like this set's color scheme myself. There's only the slightest bit of gold visible — the majority is black with transparent bright green accents, which reminds me of the color scheme you see on the covers for the covert-ops oriented Splinter Cell video games (which tend to feature a lot of black and green, including glowing green night-vision goggles). At any rate it's a lot stealthier-looking than the Stealth Hunter, although to be fair that's inspired by stealth AIRCRAFT which are usually designed to be invisible to radar rather than the naked eye. And generally, I like when the color schemes in Hero Factory remain fairly consistent. 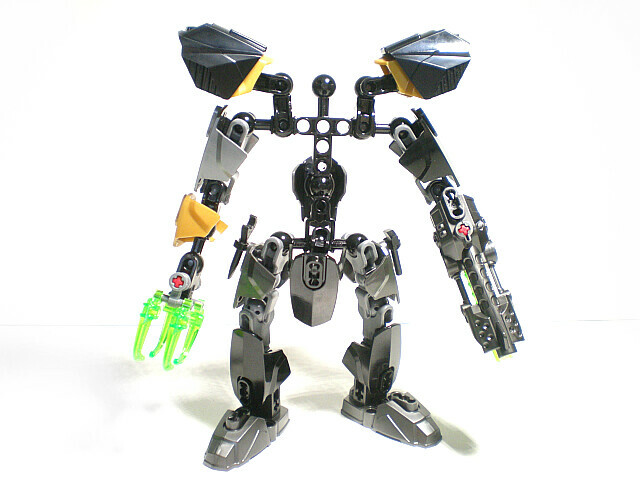 It's a lot better than BIONICLE, although to be fair that theme would often go many years between new versions of a character, and characters' roles would often change as dramatically as their colors (the person designing the original Kongu set probably had no idea that in five years they'd be making him a Toa, let alone what changes the LEGO color palette would have undergone by that time). Consider the possibility it has active camo or something (which I would be willing to bet we'll see in the tv special) which is currently offline or something. Excellent, thanks. They're going to be useful to bulk up my Beasts. Overall, not the best Machine, but a very good parts pack. And, for now, the only way to get mini-Rocka. 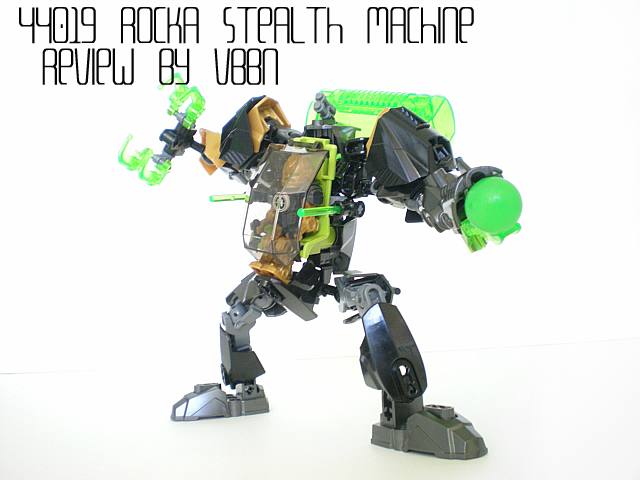 I'm not the greatest fan of Rocka, but his Stealth Machine really appeals to me somehow. Must be the shoulders and the design of his weapons. Also, Trans-neon green works wonderful with all this black. I agree with you on the colours of his right arm. While I could live with the gold, the silver shell does stands out. It's actually Tr. Bright Green, not Tr. Fluore. Green/Trans-Neon Green. Thanks for correcting me Aanchir. 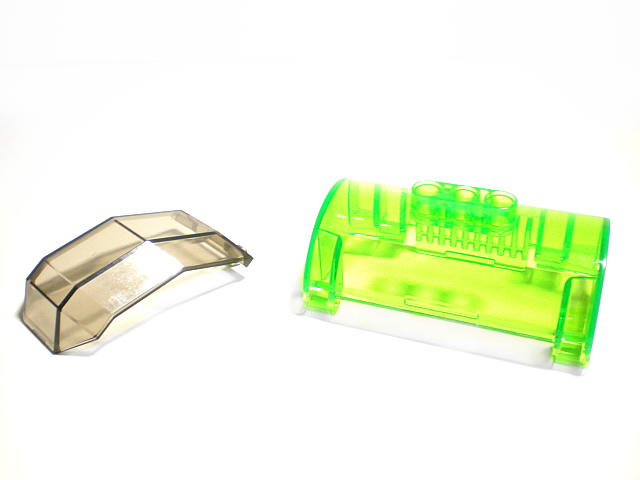 Out of curiosity, is there actually a colour like trans-neon green existing in the LEGO range? Yes, it is still on the palette. Tr. Bright Green was introduced in the Atlantis theme in 2010, but it was not meant as a replacement. Furno XL, Surge, and Dragon Bolt are all sets released this year that use Tr. Fluore. Green (Trans-Neon Green) as an eye color. Dragon Bolt and Surge also include other Tr. Fluore. 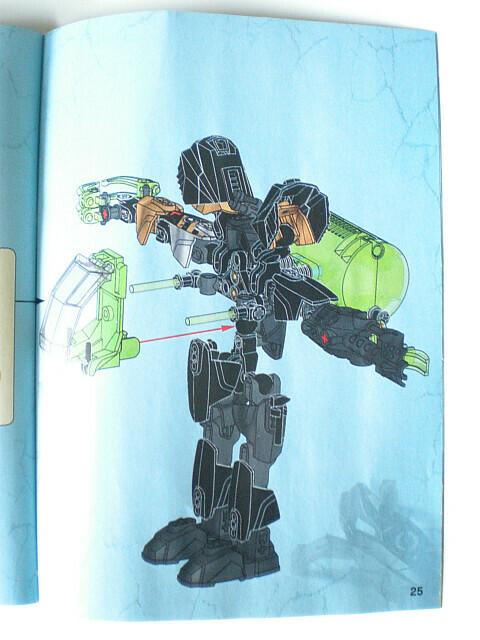 Green parts like 3M shells and Surge's visor. I haven't seen any Tr. Fluore. Green in next year's HF sets, but it's still a major presence in some other 2014 themes like Legends of Chima. Well i mostly talking about it with mechs. Well of what we have seen in that one Video that have Rocka Mech, it is good that it have a design to be Invisible, so mostly what i think about the color have change but i still think it should have a different color then Pearl Dark Grey because another color he have is white, so i like to see if they change Rocka color to Gold and White or Blacn and Gold because it will make his color different plus i love to see that Plasma Gun in Black and White.